Oh my goodness it’s a anime review thing…haha it’s been since November since in doing one. I’ve been avoiding them till now honestly but time to get back into the groove of things. Covering a off-side mecha series that don’t feel, has gotten enough love. I said I’d be going into more detail with this one. 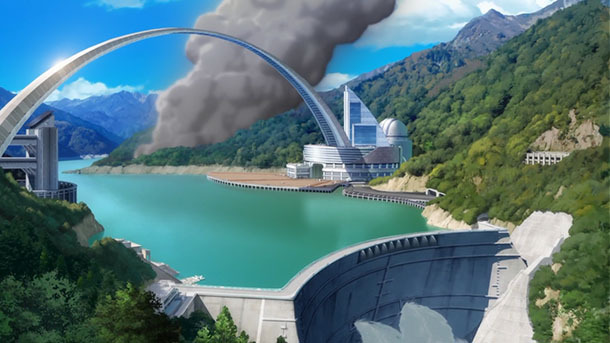 Yukina’s mother is the director of a UN research facility, her mother recovers a 60 year old artefact. Which her daughter Yukina activates by accident and inside is an old Samurai from the Sengkou period Kennosuke. This bring the mysterious alien race Efy Dolgh to invade earth and search for a special object. Kennosuke comes to aid the UN and adjust to 21st century. Oh that first gif probably looks alarming but trust me it’s not when you first watch this series. Kuromukuro was one of those shows I randomly started on a whim. What most intrigued me to begin the series, that produced by P.A Works. This studio’s gifted ability with series such as Nagi no Asukara and Hanasuka Iroha. Combining slice of life elements and real life aspects making for emotional rollercoasters. Which has been my experience with P.A Works so far. Kuromukuro is the definition marking of when a studio attempts something different. People become subjective that there favourite studio, isn’t doing what there best known for. Change is not always a bad thing come on here? 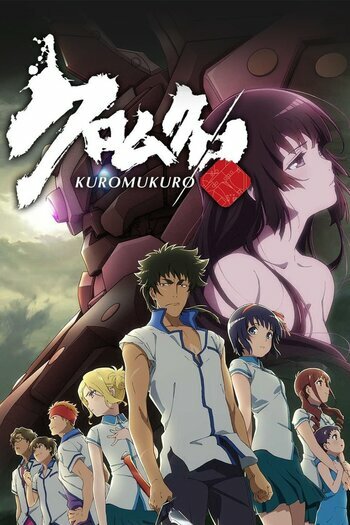 Kuromukuro was produced as apart of studio’s 15th anniversary. This was great timing for P.A Works honestly but was not expecting mecha. I honestly don’t know how anyone cannot be intrigued by this series from first glance. Non – mecha fans will have the off putting ultimately. The plot is different itself Samurai seven crosses Fafner in a way. A something old Samurai Kennosuke adjusting to the 21st century is a hilarious thing to witness. Kuromukuro had a slow start for me. There was nothing wrong with the outlay of introduction to the plot. Not overly attached to any characters to start off with. Yukina was com-plaintive and kind of useless and Kennousuke a dense samurai stuck in the wrong time period. They were a odd pair, thought no way I’ll end up shipping these two. Their first encounter when Kennosuke emerges from the black relic was pretty funny. But Kennosuke mistook Yukina for his princess from 450 years ago. Hmm wonder what’s the deal with that? It was at a snails pace in the beginning introducing the enemy, history of Kennosuke. But as they say all good things come in time? Because half way through first season found myself just addicted. I’d come right from work to continue Kuromukuro because things had finally started moving. I call it the “The Kuro Charm” because it took a while for Kuromukuro to show it. This charm comes from the characters interactions. Especially in Kennosuke case. There has never been anything funnier to me in a mecha series. Than a 450 year old Samurai or who knows how old Kennosuke is. His reactions to the modern day world are just so good, having tears emerge in my eyes. Yukina getting mad makes it all the more funnier towards him. It’s like Natsu and Lucy from Fairytail played out. Yukina is much more leaner in this case than Lucy. Speaking of Yukina and Kennosuke don’t know what it is about this odd pairing. But they just seem to work. Yukina at the beginning was a character I did not care for. 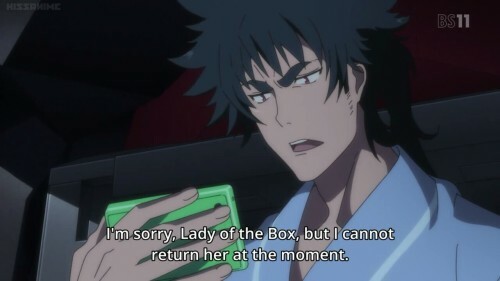 Yukina wanted nothing to do with being the only one who could pilot Kuromukuro alongside Kennosuke. Instead of sulking in denial the whole time, Yukina actually bit her tongue and dealt with it all. Yukina. Yukina became the logic Kennousuke needed. At times Kennousuke was ready to go in blindly but slowly Yukina builds up confidence to think ahead. What happens when your thrown in the deep end. The other side characters close to Yukina and Kennosuke were not real stand outs to me. Accept for one pilot Sophie who is genuinely sweet but found to be bit of a know it all. Though her character became more significant later on. When everyone interacted together, there is a great flow among. Yukina’s family found quite a humorous bunch and even more towards Kennosuke. These scenes greatly enjoyed, teasing Kennosuke in things he wanted to know. 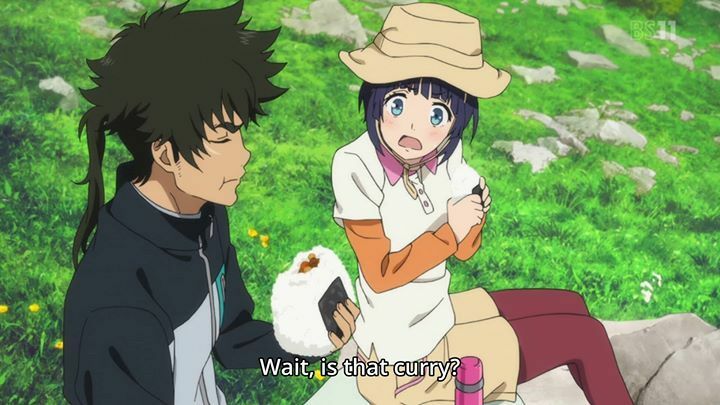 The cast for Kuromukuro are humorous, with a natural flow especially in comedic scenes. Which are funny that break up all the crazy sci-fi side of things, bringing hints of slice of life. Only characters that weren’t a stand out for me were the enemy. Efy Dolgh interesting name but that’s about it. Brainwashed minions that came to attack Yukina and Kennosuke were laughable in their attempts. Not an enemy I could take seriously. Overall terms of main cast of characters it took a while for me to find likeable. Kuromukuro has a cool cast indeed. Yeh… in the end shipped Kennosuke and Yukina what happens in every series I watch. One aspect of Kuromukuro that deserves certainly an applause. The strategically, thought-out battles and gleaming animation. This is one area of the series that was top notch throughout. I don’t really need to say that the mecha designs themselves are incredibly, intriguing in detail and ability. Kennouske’s machine was my favourite taking after him as a samurai. Mecha designs in Kuromukuro are unlike anything other mechas in other series, which makes even interesting. Every battle scene was thoroughly entertaining and quite methodical terms of strategy. In every move thought out how to outwit the enemy, that was better than two machines just going for the kill. Charging in there without any logical sense. That’s what I enjoy about Gundam for example, the strategical, planning side. Learning the details of each oppositions plan. So in the animation and battle factor you won’t be disappointed. Everything looked beautiful. Kuromukuro is not a perfect series to me. The ending is left open – ended with remaining issues unresolved. Minor light is shed on certain side characters. Plot can become confusing at points especially with the enemy. Where they exactly come from? There were so many points personally felt completely lost. But the second half of the series goes into more detail, thank god. P.A works didn’t create anything ground breaking new to the mecha genre But they indeed created some cool and most intriguing. It was a surprise to feel so swallowed up in Kuromukuro. Whenever having spare moments, just wanted to continue whenever possible. Why do I find Kuromukuro so cool? An combination of originality sci–fi elements and a samurai from Sengoku era. A cast of characters interactions that are funny and natural. Strategic, entertaining battles. Those three reason would sum up holy of why. I honestly would go as far as to say. This would be a good introduction series to non-mecha fans. Kuromukuro is subtle compared to being thrown into a Gundam. Kuromukuro is at snails pace for when it get’s to the good stuff, believe there is. Quite a few twists along the way I wasn’t even expecting but made things so much more interesting. It’s my wish this series gets another season or OVA, some conclusion give me please. It does indeed deserve it. This indeed was one mecha series with a cool concept. I do hope you enjoyed this mecha review. Feel like I’ve got my anime review mode back now. Glad I got around to covering Kuromukuro as it deserves recognition. P.A works did great on this one. !! But you lovely people let me know down below. Have you seen this mecha? What are your thought about it? Would you give it a try if your not a mecha fan? See what’s in store more for Mecha March. P.S Kennosuke and Yukina grew on me a lot in the end. I got it bad. Ahh don’t let of me mentioning the open ending put you off. It’s still so worth to watch. Oh those two 🙂 This show was so much fun.